Forecasters said temperatures in sunbaked Las Vegas could match the record of 117 degrees Saturday. Phoenix also was expected to hit that mark, matching the record for June 29 set in 1994. And large swaths of California sweltered under extreme heat warnings, which are expected to last into Tuesday night — and maybe even longer. 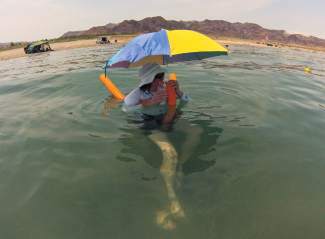 Dan Kail was vacationing in Las Vegas when he heard that the temperature at California’s Death Valley could approach 130 degrees this weekend. He didn’t hesitate to make a trip to the desert location that is typically the hottest place on the planet. The forecast called for Death Valley to reach 128 degrees Saturday as part of a heat wave that has caused large parts of the western U.S. to suffer. Death Valley’s record high of 134 degrees, set a century ago, stands as the highest temperature ever recorded on Earth. A couple hours south in Baker, the temperature was expected to peak at 120 degrees in the road tripper’s oasis in the Mojave Desert on Interstate 15. The strip of gas stations and restaurants between Los Angeles and Las Vegas is known by travelers for the giant thermometer that often notes temperatures in the triple digits. To make matters worse in California, National Weather Service meteorologists John Dumas said cooling ocean breezes haven’t been traveling far enough inland overnight to fan Southern California’s overheated valleys and deserts. The heat was so punishing that rangers took up positions at trailheads at Lake Mead in Nevada to persuade people not to hike. Zookeepers in Phoenix hosed down the elephants and fed tigers frozen fish snacks. Dogs were at risk of burning their paws on scorched pavement, and airlines kept close watch on the heat for fear that it could cause flights to be delayed.